As part of a project called iStruct, German researchers at the DFKI (the German Research Center for Artificial Intelligence) have created an awesome looking robot ape. 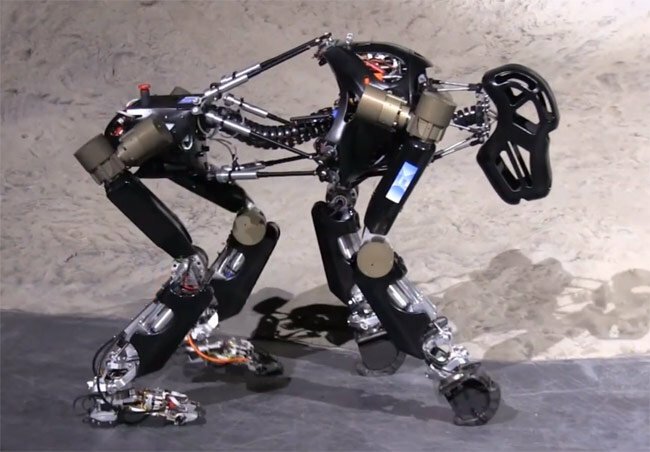 The robot ape is a cross between a humanoid and a quadruped allowing it to move around on both four legs but also stand on its hind legs when required. Check out the videos after the jump to see the robot ape in motion and learn more about its creation. “Aim of the project iStruct is the development of a robotic system as well as of biologically inspired structural components which, if applied on the robotic system, effectively improve the locomotion and mobility characteristics. In order to achieve this goal, an improved perception of the environment and the own condition is needed.